NOTE: Need to set this page up as a “category” so that it can act as a blog. 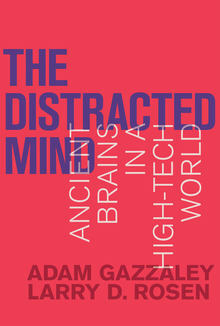 A recent article by James Lang in the Chronicle of Higher Education on “The Distracted Classroom,” points to a new book by Adam Gazzaley (neuroscience) and Larry D. Rosen (psychology) on The Distracted Mind: Ancient Brains in a High-Tech World (MIT 2016). Distraction, as Lang summarizes, is not about looking up from reading the newspaper when something interesting is happening on the subway on the way to work. Distraction is basically when you’re trying to reach a goal that matters and something gets in the way: constantly checking Facebook when you’re trying to finish writing a review that’s due in three hours. As Gazzaley and Rosen write, “The reason why goal interference in particular is so prominent in our lives, is the inherent complexity of our goals and the limitations we have in fulfilling them. Our ability to establish high-level goals is arguably the pinnacle of human brain evolution. Complex, interwoven, time-delayed, and often shared goals are what allow us humans to exert an unprecedented influence over how we interact with the world around us, navigating its multifaceted environments based on our decisions rather than reflexive responses to our surroundings.” Although our brains are limited in their ability to pay attention, the authors offer suggestions for changing them to better cope with these challenges. Prof. Jocelyn McWhirter,Stanley S. Kresge Professor and Chair, Department of Religious Studies, Albion College: "Writing Assignments" Contact her at: jmcwhirter@albion.edu.